Home » Out-of-place artefacts » Anomalous human remains » The Kabwe skull: a shot ‘Neanderthal’? A number of books and internet sites make the claim that The British Museum (Natural History) in London holds the skull of a Neanderthal, dated 38,000 years old and excavated in 1921 at Kabwe in what is now Zambia. The left side of the skull displays a circular hole about 8 mm in diameter. None of the radial split-lines that would have been left had the hole been made by a cold projectile, such as a spear, are visible around the hole. On the opposite side of the skull, the parietal bone is shattered, as if skull was blown up from inside. Two solutions have been proposed: either the skull is from something that lived in recent centuries and was shot by a European, or there were rifles in Palaeolithic Africa. Virtually nothing is correct in these claims. The Kabwe skull (often known as ‘Broken Hill Man’ after the name of a nearby town) is older than the claim, at 125,000 to 300,000 years old, and it was found on 17 June 1921 by a Swiss miner, Tom Zwiglaar, in a limestone cave. It was the first early human fossil to be found in Africa and was sent to Arthur Smith Woodward (1864-1944), who gave it the new species name Homo rhodesiensis (Rhodesian Man). More recent anthropologists have preferred to see it as a primitive form of Homo sapiens, but are undecided on the precise species. It may be related to Homo heidelbergensis, the ancestor of the predominantly European Neanderthals (there were never any Neanderthals in Africa) or it may indeed be a separate species, Homo rhodesiensis, as Arthur Smith Woodward originally proposed, which would be our direct ancestor. So much for the species and the date. What about the “bullet hole”? Well, for one thing, it did not kill the individual. The edges of the lesion have started to heal, so whatever caused the hole was not the cause of death. Instead, the wound appears to have been a pathological, rather than a traumatic lesion, caused by an infection in the soft tissue over it. Few individuals survive a bullet to the brain; needless to say, the parietal bone on the opposite side is not shattered, as is claimed, but is mostly intact. Although part of the lower parietal bone has broken off, the break is not a result of shattering. It looks more like damage that occurred after the flesh had decayed. The individual may thus have died from a pathological condition, perhaps an abscess or ulcer that had become septic. 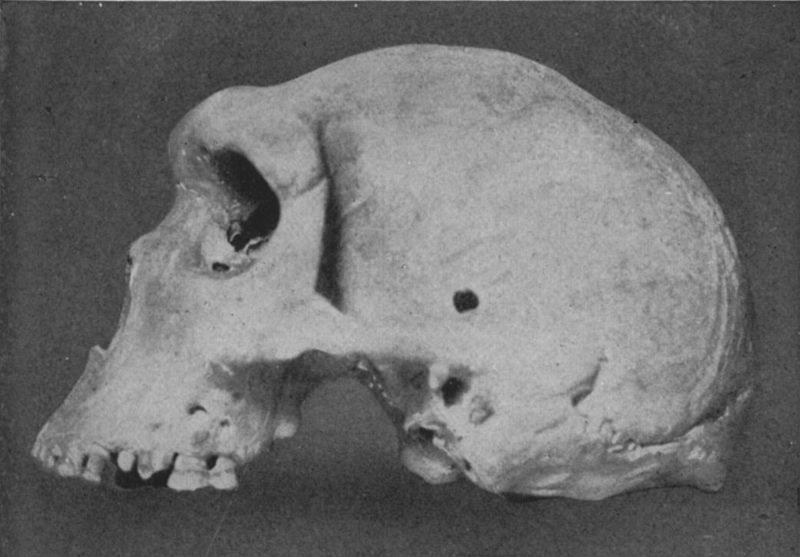 18 Responses to The Kabwe skull: a shot ‘Neanderthal’? And your conclusions about the”bullet hole” are based on…? What Science-Cult told you is Not “Common sense” but brainwashing Lies, OK? especially Evo-fanatics. If you has actually read the piece rather than dashing off insulting comments, you’d see that I do deal with the alleged “bullet hole”. How do you know that the hole had started to heal? Where did you get the info? Also are there any pics of the exit wound? How do you know the exit wound is intact? The hole has started to heal because reactive bone growth is visible around its margins. That’s pretty obvious from the photographs and even more so if you bother to visit the Natural History Museum when it’s on display. There is no “exit wound” because it’s not a hole caused by a projectile. Again, if you look at photographs of the skull, you will see that the opposite (right) side is largely intact. And one more thing: Mr. Fitzpatrick-Matthews you are clearly more patient and magnanimous than I since you have allowed these ridiculous comments. That said, it’s almost always better to engage these attacks logically than to shut them out. One mind at a time. This is how we move forward. I realise I’m a little late here but for God’s sake people what’s wrong with scientific analysis? Are you so bored with the universe the way it is that you must abandon rational thought? This guy has clearly shown how we have been duped. Be happy with that. 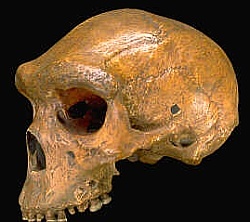 neanderthal skull: search Google for this image, I have no idea what did you wrote, Sci-Cult fanatics. I think this skull belongs to Homo heidelbergensis, which gave rise to both the Neandetals (Homo neandertaliensis) and us (Homo sapiens). I think Homo heidelbergensis was a purely European species. The term Homo rhodesiensis seems a good one to me (though I am not a biologist!). Any ideas as to what DID cause the hole? If this is a neadererthal man, i’m a rabbit. So… the wound was made by a hi-speed projectile, but because the hole has the appearance of repair, the assumption is that the apparent exit-wound is nothing of the sort, correct? Sounds a little reachy to me. If a high-speed projectile hit BHM then it killed him, & the high speed entry wound injury explains the apparent exit-wound on the exact opposite side of BHMs head. It might also turn out to be easier to explain the apparent repairing of the injury as an effect of fossilisation. I’m still going with bullet wound. Nothing here is any less likely a scenario, based on the evidence. But really, these guys do look similar enough to us that someone out there probably has a head similar to that Rhodesia dude. Also, if they were an ancestor to both Neanderthals and modern humans then I would think they would be a subspecies of Homo Sapien. They may even be a variant of Heidelberg man, which if that’s true then the sentence above can still apply.